You'll be(e) the most glamorous lady out there! 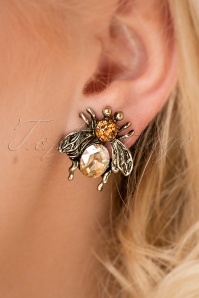 Because these 20s Gracie Bee Stud Earrings in Gold are truly be(e)autiful! These bees are made of antique gold toned metal, embellished with a larger faux diamond in light yellow and some smaller rhinestones in honey yellow. Add them to your shopping bag and they'll be flying your way in no time.